As promised some news on the vegetable patch. The chard is looking good, such a reliable and delicious vegetable, everyone should grow it. The alliums aren't quite so perky. The overwintered garlic is dying of rust and I'll have to dig that today I think. No point in leaving it longer. The other garlic was mashed under the feet of those marauding cows and isn't going to reach its full potential but I think it's worth leaving in a bit longer. The japanese overwintering onions are small, also a bit trampled but otherwise would have been fine for what they were intended for, which was an early crop of onions to be eaten over the summer. Unfortunately the main crop was never planted so that's it for onions this year and they won't be nearly enough. Shallots, just a few, were late in and don't look much cop but we'll see what happens now the longest day is past. Is it a root, is it a pea? It's flowering at any rate and that means there might be some aardaker seeds available for swapping in the autumn. Like most of the novel crops there are rarely enough to harvest to actually eat but this clump has now been in situ for two years and with some seeds as insurance against losing the lot it might be worth taking some of the tubers later in the year. The other peas are trying to grow big enough to climb their supports and show no signs of flowers yet. This is because they were nearly all checked in pots before I had places to plant them out this spring. They're making good growth now so all should be well soon. The exception is the Raisin Capucijner peas which are flowering and forming pods. I'll cover them in part two. The pictures I took were too blurry. Edible thistles. I read somewhere that most thistle heads are edible if only one could be faffed to prepare them. The globe artichokes suffered badly in the terrible winter two years ago and didn't look like they'd survive but after a year of recuperation one plant at least is having a go. The cardoons are in flower too. Again you can eat the heads of these but it's a painful task for little reward. I missed my chance to blanch the stems in the spring when they were lush and lovely and now they are more ornamental than useful but I should be able to carry them through the winter for another go next time. Root vegetables are a write off this year. I put some carrots in late last autumn, not because I was expecting much of a crop but to provide foliage for the Swallowtail butterflies to lay their eggs on this spring. Inevitably then, the carrots have done what comes naturally to them (do you hate Eggheads too?) and thrown up flowers. Carrots cross breed rather promiscuously and as I have yellow and orange rooted sorts in the patch any seed won't be a pure variety. Still, as I've never saved carrot seed before I'm tempted to give it a go just for the experience and see what comes up. I also had burdock and evening primrose in the root bed, both coming into flower nicely. It's my own fault, I did dig some but they were pathetic, tough and weedy thanks to the poor stony soil. It's beginning to look like raised beds might be a help with improving yields around here. 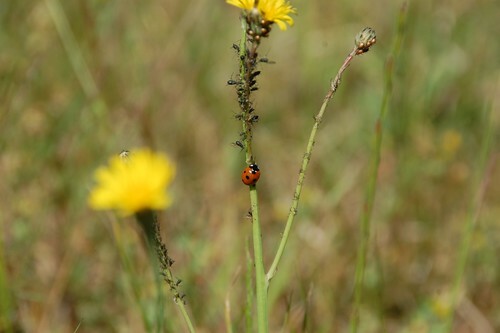 Glad to see the ladybird attending to its task with vigour.